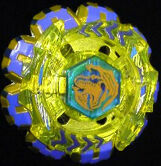 Divine Chimera TR145FB is a Limited Edition Balance-TypeBeyblade that only appeared in the manga, Big Bang Bladers. It's owner is Kakeru Tategami, the younger brother of Kyoya Tategami, who also only appears in the manga. Originally, it was released as an lucky draw to subscribers of CoroCoro but later had been released on December 2010 for everyone in Japan. Divine Chimera was the result of the "CoroCoro Design a Beyblade Contest" that ended sometime in 2009, where Bladers had the oppurtunity to submit their own Beyblade designs and the winning design would be made into an actual, real-life Beyblade. The two winning designs, "Fire Crocodile" and "God Birdshine" were chosen and used elements of them together in order to create Divine Chimera TR145FB. The Face Bolt depicts "Chimera". In Greek mythology, Chimera was the female sibling of Cerberus and the Hydra, that was composed of various parts of an animal, usually the body of a lioness, a snake's head at it's tail, and a goat's head protruding from the centre of her spine; but she can be made up of mixed parts of various animals. The design features Chimera, represented with the head of a crocodile, the wings of a bat, and the tail of a scorpion in an orange outline tattooed onto a translucent blue Face Bolt. 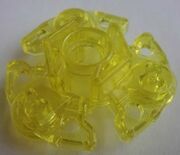 Chimera is a translucent yellow in colour, similar to the Libra Ring in Infinity Libra DF145BS. It has two crocodile-like formations on opposite sides with four blue arrows pointing in the opposite side it is facing. It appears to fit the Divine Wheel with ease. Divine is a Fusion Wheel very similar in design to both Rock and Counter. In that, it features various square-like protrusions, but unlike Rock and Counter, Divine contains nine of these protrusions. These protrusions also feature a small gap between them. Performance-wise, Divine is a terrible Wheel that should never be used for competitive play. Due mostly to it's light weight, it does not have any Attack, Defense, or Stamina potential whatsoever. It is gold in colour with small blue highlights on the square-like protrusions. Triple Roller 145 (TR145) as it's name implies, is a Spin Track with three non-free-spinning wings similar to WD145 with three small free-spinning wheels on each wing. The wheels essentially "roll" in order to absorb shock like how rubber does. Some say it used to be top-tier in Defense until R145 and BD145 came. It is a translucent lime green in colour. Flat Ball (FB) is basically Flat and Ball put together into one Tip. While retaining the general appearance of Flat, it has a circular hole in it similar to HF but wider and in that hole, is a Ball Performance Tip protruding from it to slighly appear above the hole. It is a translucent lime green in colour. Prior to the release of Random Booster Vol. 8 Jade Jupiter, this was the only way to obtain the Divine fusion wheel, TR145, and FB,but it is still the only way to get the chimera clear wheel/energy ring. 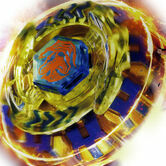 This is the first beyblade to be created by the fans in a contest instead of employees at Takara Tomy. Nobody knows the names of the fans who created this Bey.